Even if you aren't a major fan of catwalks or checking out clothing labels you can't afford, what LFW can provide is an insight into creating your summer 2013 wardrobe. Maybe to some it seems premature but if like me you look outside your window at the miserable rain, you'll love nothing more then getting started with what to wear Spring/Summer 2013. Although I didn't go to see any catwalks myself, as always I took advantage of their live streaming. 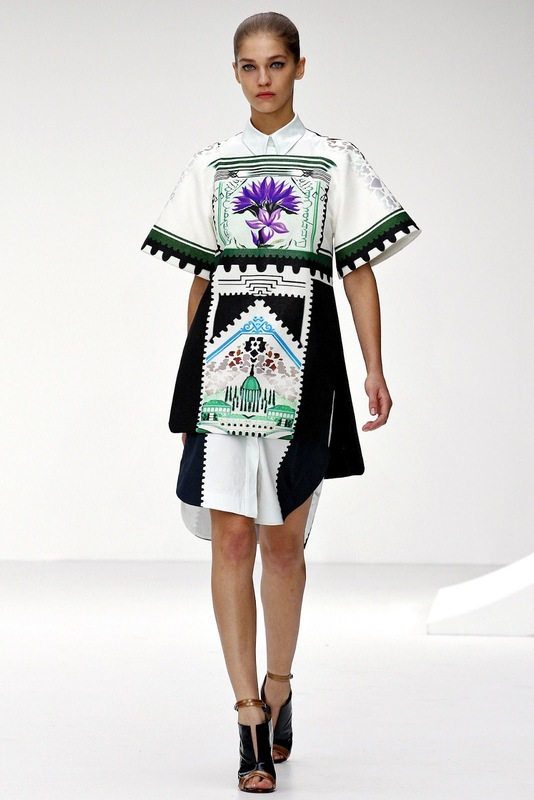 Surprisingly for me my favourite of all the collections had to be Mary Katrantzou. The Vogue's Fashion Editor Frans Burns said, "It was a fantastic move forward. The shapes felt so modern and uplifting", and I couldn't agree more. Her designs came in the form of stamps money and flowers giving her collection an original and fresh feel. The cuts and prints truly made it stand out from the other catwalks. It was something I could see myself buying and wearing which is exactly what you want. Another stand out collection (as always) was Vivienne Westwood's Red Label. You will be as shocked as I was, when I read on Vogue's website that she told them, "she doesn't really care about fashion", and that she was using this collection to make a statement about what she really cares about, Climate Revolution. Her collection had an American 40s & 50s vintage twist but according to her you are under no obligation to buy any of it. Actually she would prefer that you hoard your old clothes and only go shopping if you actually need something new. 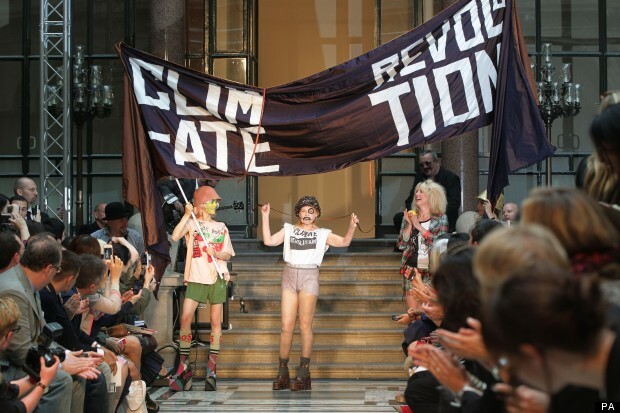 She made sure her message was heard by emerging at the end holding a banner with the the slogan "Climate Revolution". Then there is the Henry Holland catwalk, one of my new favourite designers, (I have become addicting to watching him on Styled to Rock) I bought some of his items at London Fashion Weekend as I just couldn't resist. His collection was as expected fun and funky, mixing colours and prints to design some real creative pieces. He has used some of my favourite looks (above) with crop tops being a big trend this and next summer. Also an childhood fave tie-dye. This look in particular reminds me of how much time I spent as a child trying to create this look with my own t-shirts. He definitely brought huge amount of colour into this Spring/Summer 2013 LFW. A collection we just can't ignore this LFW is Philip Treacy. With Lady Gaga opening in this outfit (below) it started what we could call a wide range of amazing head gear for the Treacy collection. It went from small and cute to huge and simply outrageous! A combination of Lady Gaga and Michael Jackson styles made this collection one to watch on the catwalk this LFW. Pale and pastel colours are the ones to watch this Spring/Summer and the main thing I took away from this LFW is mixing prints is still cool so what more could you want? !